Description: This item was claimed to be a vintage Garbage Pail Kids iron-on. The seller reversed the picture of the iron-on, so the buyer could see how the design would look if it was ironed onto something. This iron-on appears to be approximately 8-1/2" x 11", and it most likely is not vintage. Description: These items are from an Italian trading card release called "Sgorbions Greetings Cards". There were Garbage Pail Kids releases from Italy with the Sgorbions title, but Sgorbions Greetings Cards does not have anything to do with Garbage Pail Kids. Sample images of the box, unopened packs, and cards are shown above. The set is mostly comprised of cards from Topps' Gruesome Greeting Cards, but all of the text on the cards is in Italian. Description: This item is a keychain with a homemade Garbage Pail Kids insert. 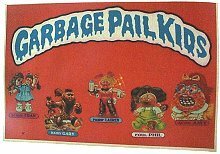 The design of the insert was taken from the Garbage Pail Kids Online website. The Garbage Pail Kids Online website is now closed. The image used for the keychain was squashed to fit into the rectangular area on the keychain. Description: These items are Garbage Pail Kids lapel pins that were made by peeling off Garbage Pail Kids stickers and sticking them onto rigid pieces of plastic that have pin backs. Some of the pins were decorated with rhinestones. Each pin measures approximately 3-1/2" x 2-1/4". Description: These items are lighters that have homemade Garbage Pail Kids stickers stuck on them. The stickers were cut, so the lighters could open. 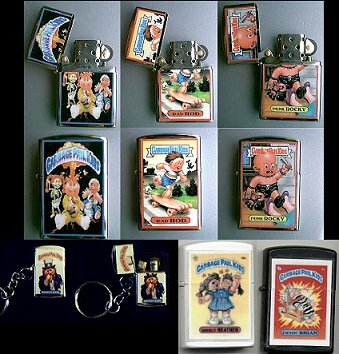 The lighters shown on the top row were made by the same person that made the Garbage Pail Kids cigarette cases and the Garbage Pail Kids keychains. The lighter shown in the lower-left corner is also a keychain. Description: This item is a blue lunch box with a Garbage Pail Kids sticker stuck on it. The sticker on the lunch box is from the United States Garbage Pail Kids Giant Stickers, and the sticker is from card number 4 "Foul Bill (Baseball Cards)". Description: These items are magnets that were made by sticking Garbage Pail Kids stickers on a rigid backing. The rigid backing was decorated with a color edge. The front and back were possibly covered with polyurethane to protect the stickers and decorative edge. A magnet was glued onto the rigid backing for each item. 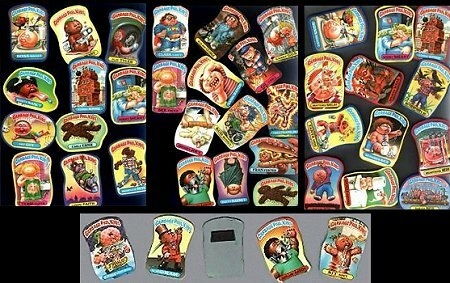 Description: These items are Garbage Pail Kids patches. The patch on the left was purchased at a flea market. It was probably made on a computerized sewing machine. The two patches on the right were made by drawing Garbage Pail Kids characters on pieces of cloth. 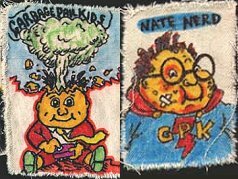 The drawings on the patches are of the United States Garbage Pail Kids 1st Series character 8a Adam Bomb / 8b Blasted Billy and the United States Garbage Pail Kids 5th Series character 172a Nat Nerd / 172b Clark Can't. The patch with 172a Nat Nerd / 172b Clark Can't had the name "Nate Nerd" written on it. Description: These items are pillows with the United States Garbage Pail Kids 2nd Series character 45a Leaky Lindsay printed on them. Description: These are a variety of Garbage Pail Kids clasp pins. Most of the pins measure around 1-1/4" x 1-3/4", but the pin on the top-left actually measures around 2" x 2-1/2". The pin on the top-left is of the United States Garbage Pail Kids 1st Series character 8a Adam Bomb. 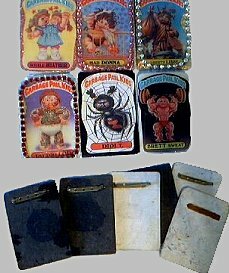 The pin second from the left on the top is of the United States Garbage Pail Kids Giant Stickers card number 9 "Visit Garbage Pail National Park". 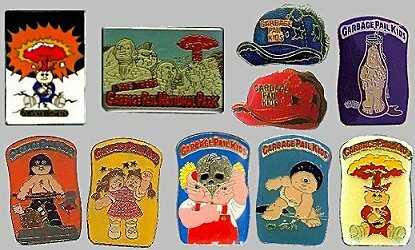 The two pins that are second from the right on the top are of the baseball hat that appears on the United States Garbage Pail Kids Giant Stickers card number 4 "Foul Bill (Baseball Cards)". The pin on the top-right is of the United States Garbage Pail Kids 4th Series character 128a Sloshed Josh / 128b Low Cal. The pin on the bottom-left is of the United States Garbage Pail Kids 4th Series character 137a Max Axe / 137b Deadly Dudley. The pin second from the left on the bottom is of United States Garbage Pail Kids 2nd Series character 49a Double Heather / 49b Schizo Fran / 49b Fran Fran. The pin on the bottom-center is of United States Garbage Pail Kids 4th Series character 132a Bony Tony / 132b Unzipped Zack. The pin second from the right on the bottom is of United States Garbage Pail Kids 2nd Series character 44a Sy Clops / 44b One-Eyed Jack. The pin on the bottom-right is of the United States Garbage Pail Kids 1st Series character 8a Adam Bomb / 8b Blasted Billy. Description: This item is a plastic Garbage Pail Kids mug. 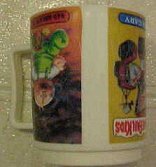 The mug was made by Peter Pan Industries back in 1986, and it is a licensed item. The mug shown was manufactured incorrectly. The plastic strip with the characters was put on the mug upside-down, and there is a slight overlap where the strip was attached to the mug. Description: These items are postcards with Garbage Pail Kids stickers stuck on them. The United States Garbage Pail Kids 3rd Series sticker 113a Alice Island was stuck on the postcard with the blue text and outline. 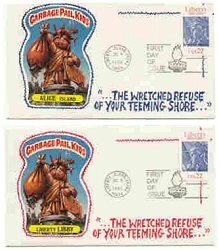 The United States Garbage Pail Kids 3rd Series sticker 113b Liberty Libby was stuck on the postcard with the red text and outline. The quote, "...The wretched refuse of your teeming shore..." printed on the postcards was taken from the poem "The New Colossus" by Emma Lazarus and is on the base of the Statue of Liberty. Description: This item is a poster that was purchased at a flea market in Florida. It is a promo poster for Disseminated Productions. The poster was originally an item from a toy convention. It is of the United States Garbage Pail Kids 1st Series character 13a Ashcan Andy, but the name was changed to the name of the company. The poster measures 4" x 5-1/2", and the die-cuts were drawn in. 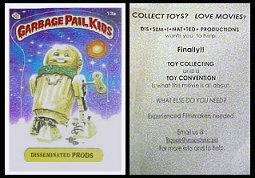 The back of the poster says, "Collect Toys? Love Movies? Disseminated Productions wants you to help. Finally!! Toy Collecting and a Toy Convention is what this movie is all about. What else do you need? Experienced filmmakers needed. Email us @: (email address) For more info and to help." I did e-mail the person who made the poster, and they said the poster was for a movie that his digital media company was going to make. The movie was supposed to be about four guys in their early 20s going on a road trip to DragonCon in Atlanta to get original Garbage Pail Kids artwork. I am not sure if this movie was ever produced.